When I was little, I used to watch a bunch of cooking shows on PBS when I was at my grandmother’s. Do you remember any of those? I’m not even sure they still have them. One of the more fascinating ones was Yan Can Cook. Yan would fling knives around while chopping and dicing. His hands flew and he tossed his wok like he was flipping pancakes. I always had the impression that Asian cooking was incredibly complicated thanks to Yan. Yes, it looked fun but who has time for all that. Since I’ve experimented on my own with international dishes, I’ve realized that my assumption was wrong. Asian cooking really isn’t that complicated or time consuming after all. It’s a (hella) bunch of chopping, but once you’ve chopped the rest comes together in the blink of an eye. I’ve played with making Korean bibimbap and with Korean tacos and both tasted amazing. Apparently I have a thing for Korean food, because there are a few other dishes like stewed chicken and a BBQ dinner bowl as well. 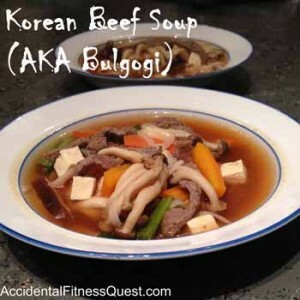 I read through a few descriptions of the soup from Korean menus to come up with a list of veggies that went into it. It didn’t seem too complicated but I figured (correctly) that Walmart didn’t have the fancy mushrooms. I headed over to the farmer’s market to see what the options were there. They had all kinds of mushrooms from big to small, singles and clumps. I found the required enoki mushrooms and gasped in horror at the price. Um, these cute little clumps were $19.99 per pound. I backed away from the mushrooms and thought you’ve got to be kidding me. Are they secretly dipped in gold? Do they solve world peace?! Don’t panic if you can’t find enoki mushrooms or don’t want to mortgage your house to buy them. They aren’t a requirement for this recipe. You can leave them out or use regular mushrooms in their place. They did look pretty cool in the soup though. The Kid said they looked like little aliens or a baby octopus. Cut the steak into thin strips. In a bowl, mix the soy sauce, sugar, sake, sesame oil, and garlic. Add the steak and toss to coat. Set aside to marinate while you prepare the veggies. 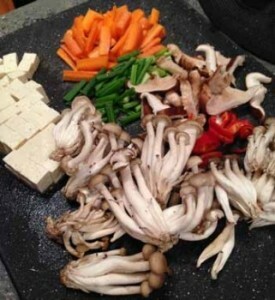 You can prep your veggies in any order you’d like. I just put together a list of what I did since each veggie was cut a bit differently. Wash and slice the shiitake mushrooms. Just rough chop them into pieces. Cut the carrots into matchsticks. I cut each carrot into pieces about an inch long and then sliced each piece into matchsticks. Drain the tofu and cut into bite sized cubes. My cubes were about 1/2 inches. Remove the seeds from the jalapeno and slice. Be careful and don’t touch your eyes or nose! Cut the green and white parts of the green onions into 1 inch pieces. Break the enoki mushrooms into small clumps. Here is a picture of my ingredients after chopping so you can see what they looked like as reference. Heat a large soup pot over medium high heat and spray with non-stick spray. When the pot is hot, add the steak strips and stir fry for about 3 minutes until no longer pink. Discard any leftover marinade. Reduce the heat to medium. Break the rice noodles in half and lay over the beef pieces. Add the broth and lay the veggies and tofu on top of the noodles. I just arranged them all neatly on top and kinda pushed them slightly into the broth. Bring the soup to just a low simmer (not a full boil) and simmer for about 5 minutes until the noodles are cooked. They cook pretty quickly since they are rice noodles and just need to soften. Remove from heat and divide evenly into bowls. Makes 6 servings at approximately 222 calories each – 25g protein, 17g carbs, and 6g fat.